Besides being fairly self-explanatory why concept vehicles don’t translate to production, the idea that Cadillac’s gorgeous concept vehicles over the past few years haven’t seen the light of day, or much production influence, is an oft-brought up topic. We’ve had Ciel, Elmiraj, and most recently, Escala to drool over in recent years, but GM Vice President of Global Design explained to Automotive News why these cars don’t make their way to the assembly line. Every designer would like to see every design he’s had a hand in go to production, but that’s just not the way it is. We do concept vehicles for many reasons, whether we are previewing a design direction we are going to take as a company, previewing a new vehicle or sometimes just talking to ourselves, redefining for ourselves the direction we want to take a brand in. In the case of Escala, the concept certainly falls into Simcoe’s latter statement. Escala is meant to preview the future design direction Cadillac will take. However, we can certainly point to Lexus as a brand that has waved those notions away in actually producing the LC500, itself looking very close to the LF-LC concept. Specifically, on Escala, Simcoe said it’s the clearest picture of where Cadillac will move in the near future. It’s the epitome of where we are going to take Cadillac design. It’s meant to be a flagship vehicle. It describes proportion. It describes simplicity of surface and a wonderful interpretation of interior. All of those design details — graphics, character of the grille surfaces — you can place on any vehicle in the Cadillac brand and range. So, realistically, will it influence SUVs, performance sedans and anything else we do across the range? Yes. Fortunately, a Cadillac flagship is still on the table, according to brand president Johan de Nysschen. What type of vehicle that will become remains a mystery, though. since they said that the future flagship won’t be a 4 door sedan….I don’t know the answer….a CUV/SUV or a Tall Wagon will be the best bet for a flagship if its not going to be a sedan. Why don’t you just make up your own answers about Cadillac’s future product plans? It hasn’t stopped you before. What’s the point of all this wasted money when we have to wait 10 years to see a fender that kind of resembles one of these concepts. I think we will more than likely see some of these design elements in the next generation of Cadillac vehicles coming in the next couple of years. the ATS replacement, the CTS replacement, the new CUVs and whatever true flag ship they decide on. There was many decades where cars were true show cars and while they did not go into production they did preview elements that did go into use in the future based on public reaction. Case in point the Motorama cars of the 50’s were all pretty much pure show cars out side the Corvette. While the Motorama Corvette Nomad never made production the elements did in the Full size Chevy based Nomad. That is how Cadillac is using their show cars in a more traditional ways. Now the cars that go from Show to production that we have seen in the 90’s and later for the most part were production cars that are customized to make them into a show car. Pontiac did this with the Grand Prix etc. A rare few go from pure show to production like the Camaro, Prowler and SSR and they really end up with issues in ergonomics etc. The real issue today many people have a hard time with telling reality from fantasy and they can not tell a real show car from a customized production cars today. This may be due to the better job they have done to make these cars appear real. People then get mad because they expect it to be production even though there is little way to make many of these cars pass a crash test or live in a real world. When we see these cars one has to consider one would it pass a crash test with out things like a B pillar etc. Ride heights and bumpers would they pass DOT test? Is the interior real or just a mocked up printed one? Is there really a real chance GM would build a V16 for a very few number of cars that would be sold. The one that ham strings many concepts is there a platform that could support it. This one killed the Elmiaj as the Omega would not go to the right wheel base to support it. I don’t know about the lack of platform for the Elmiraj, as Ed Welburn stated the car was very build-able with a few minor changes. I think this is a pretty good indication that a Escala type car is the upcoming flagship. I hate saying this but I hope not. The Chrysler 200 is more.daring than Escela. Ok, now build the Ciel and the Elmiraj. the only problem with the Escala…is the sloping roofline….it doesn’t go with Cadillac and it looks too coupe like and too reopen but everything else about the Escala is stunning because the profile looks different from the current slab-sided Caddys…..what about the Escala styled CUV/SUV without the coupe like roofline. I’m afraid a sedan or a coupe/four door coupe, mid engine sport car…will be money losers. however Caddy needs a new design them…caddy needs to get rid of the same watered down wedged shape profile if they want to bring some WOW factor to Cadillacs designs. I hate the headlights and grill. It looks cheap as well as uncreative. Buick does better. Volvo has developedan almost retro-styled waterfall/radiator pipe grill that looks unique and upscale and reminds even the casual car buff that there are endless possibilities for creative design. OK guys what part of this did you miss? The Ciel, Elmiraj and Escala are not real cars nor a exact perdition of a coming model. What you have here is a car that indicates some traits and ideas that will be used in future models that are not any one of these models. The nose styling could be the new face the interior here could be the new style dash or seat they will look to use. Some body lines may be used etc. Cadillac has a host of SUV and CUV models coming but they will remain a luxury car company too. Lets let them release the real thing before we worry about sloping rooflines that may never be or a coupe that never was. We could easily see parts of all these cars used in new models of types. What was made clear here is there are hints here not a whole future model. Scott, I will have to disagree. This is the question the interviewer asked Simcoe verbatim that was left out of this GMA post “The Escala five-door concept explores a different way to offer utility than an SUV. Is that a direction Cadillac is going in? ” and Sean posted the reply on this article. So whether Cadillac makes the flagship this style of five door or it turns up in a lower end model, I think its safe to say that Cadillac will have a model like this. Will see. Until one shows in the show room anything can happen. I see the 5th door a response to the Tesla in a way more than anything. With so many SUV models coming though do they really need that? But the key here as I have stated parts of the three show cars could end up in the mix but the car shown to us is not going production as shown. The fact is the Escala is not production and the new car could be a 5 door or it could be something totally different. Time will tell. This is Cadillac flagship. In some shape or forum. the Chrysler 200 is a turd…why are automakers picking the coupe like sloping roofline…it makes no sense. Fast back is the trend as well as couple like styling in a sedan. The 200 was a turd be cause the car itself was a turd. When reviews put it as not as good as others in class but much better than the Sebring/200 it replaced that is telling. Damn, can’t wait for the new models. I get the point of the article, and it makes sense. This has always been the point of most concept vehicles: to showcase future design and technology; and in fewer cases, an actual production vehicle. Some vehicles translate very well from their concept counterparts. Look at the Camaro for example. Also the XLR and ELR. All were almost identical to their concept designs. I’m quite certain Cadillac could easily conform at least the Elmiraj to a handsome, large coupe. Sure there’ll be some sacrifices to accommodate safety and practicality, but I know they could still produce a striking production car. The CTS successfully borrowed some good traits from the Ciel/Elmiraj; albeit still watered down quite a bit from those designs. The same can be said about the new LaCrosse. Either way, I would like to see an evolution of Cadillac’s art & science design motif. Sometimes (but rarely) concept vehicles do make it to the showroom. The Cadillac Evoq spawned the nearly identical XLR. The exterior differed very little, but the Evoq’s trunk lid tipped backwards, while the XLR’s rear deck lid used a scissor-lift mechanism to accommodate the folding top. Cadillac has been watering down the same A&S design theme for 15 years now….to me its just getting old and redundant….besides the fastback coupe like trend won’t last long and its the 2010s trend. Art and Science appears to be nearing an end. It began in 1999 & has run it’s course. With this said, Cadillac needs a solid design philosophy. Benz has really transformed over the last decade. A leap will be easy for Cadillac because not one A&S vehicle has reached iconic status. It served as a great segway away from Cadillac as sofa-on- wheels to a true German rival. Cadillac can’t through iconic design cues (fin tail lights) out the door, however, and should look to Jaguar as an example of evolving history. I think in most cases a concept showcases what the designers could do in a fantasy world . But they can also showcase certain design elements of what is to come . And an automaker can gauge what interests the public instead of a small focus group . I don’t think you can really call the Escala an evolution of A & S , that term is not what it once was . Look at the shape of the hood or the D-pillar things are smooth , rounded with crisp details . If the face is an example of the future the headlight assemblies are much smaller and more integrated into the front end and grille . It even makes the CT6 look old already when the two are compared . What does bother me is the plain crest , and we are seeing it already on the XT5 and CT6 front fenders . It started out as the center of Cadillacs wheels and now they showcase it on the front grille of the Escala . I’m all for the wreath being gone now but the new crest they are currently using looks good . I hope Cadillac isn’t taking the same route Buick did . those concept cars have made the current A&S cadillacs look cheap and dated…..Cadillac needs to bring back the true iconic shapes and cushy seats back again….. the slab-sided sheet metal and stiff and hard seats….just screams… cheap, uninspired BMW wanabee. Can anybody tell me how is possible that Cadillac is not present at the 2016 Paris Motor Show? If they want to compete with Mercedes, Audi and BMW, why are they missing one of the most important events in Europe and the world???? 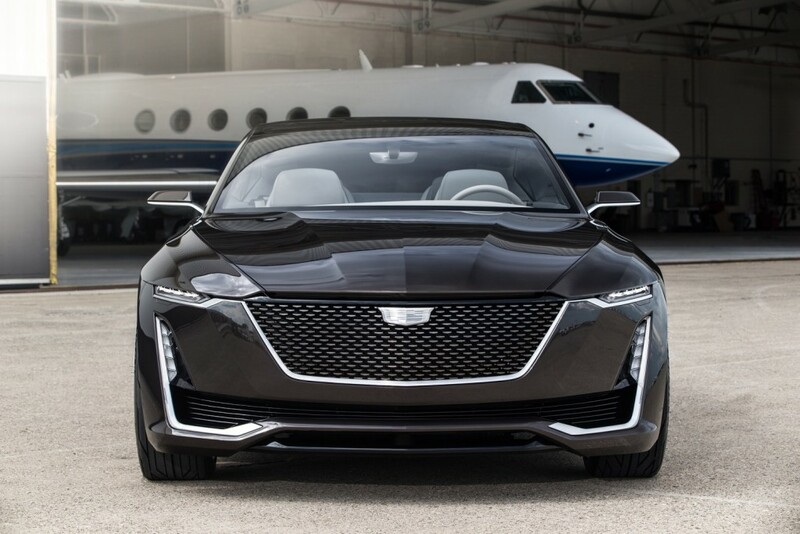 While we may not see a Escala in production, one has to think the Escala will serve as inspiration as to the direction of future Cadillac models which means the possibility of seeing headlights from the Escala in a future model like the next generation ATS Coupe.